Hmmm isn't that more of a 3D section? In this section i see a lot of 32*32 and lower spriting here in this section, my floor is 64*32 so it's not really lower spec then what i see in the normal pixel art section. Or is it a section for more realistic kind of art, still i'm doing isometric which has a lot to do with pixel art, but i'm looking for a more realistic style. For one the palette isn't indexed (amount of colors are limited), or doesn't seem like it's indexed, like it is on pixel art. Looks like you mostly painted a texture and skewed it, then touched it up--which is nothing bad considering the kind of stuff you're doing, but doesn't seem like pixel art to me. k, how do i get this moved to the low spec section? I tried to report my post but that didn't work, can i PM a moderator about this? Btw, i did not skew it, i painted directly on my template. I reworked the wooden wall to try to make each board stand out a little more. I also made a frame around the window. Is there a way to use pixel art and get the same kind of style i'm going for? I have seen some really good pixel art pieces here that look pretty realistic, but i guess thats very hard and takes very long. I need atleast 50 walls and even more floors so i like to cut a little on time. But if anyone want to have a go at it with i post my templates. The blue on top is the illusion how thick the wall is and will be overlapped if another floor/wall is on top of it. The green edge on the right only shows at a bottom corner, otherwise there is a 1 pixel seam in the wall. The left wall and right wall should overlap each other in the middle by 1 pixel. iguess the floor speaks for itself. What's this for exactly? I wouldn't mind helping out with some pieces. I have started on my first "real" game with XNA. After doing various tutorials and fiddling around myself with some code i'm pretty confident i can make my own, slightly complicated game. 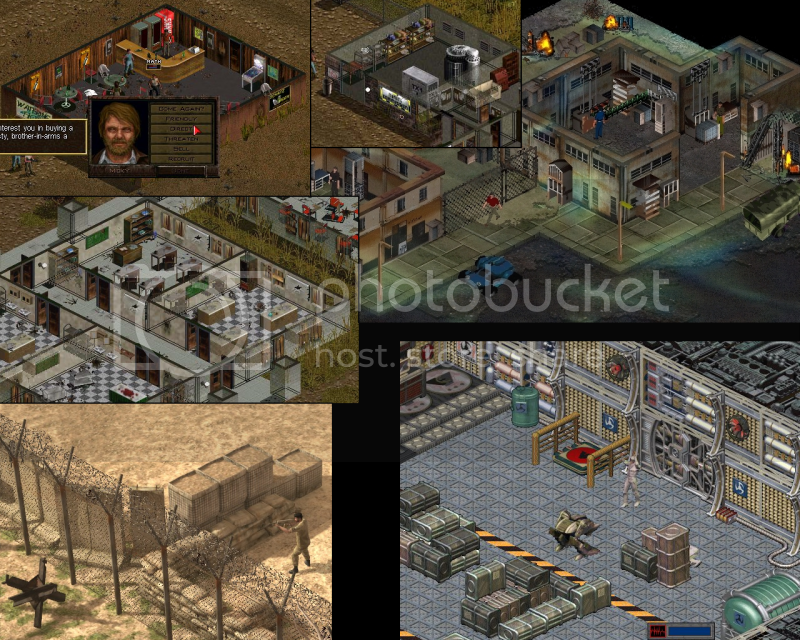 It will be a turn based / squad based strategy game like x-com, fallout and jagged alliance. The game will mostly resembles jagged alliance since it's going to involve mercenaries. And i'm planning to add a global view like the geoscape in X-com where you have to manage things like finances, contracts, arms, bases etc. Currently i only have the editor partly finished. I also need to add functionality for a blend layer for plants, path edges, etc. And a object layer with objects like tree's, tables, posters, etc. The latter will also involve interaction for the player, like guns he can pick up or a switch to open a door. The editor does export everything already very cleverly to XML. I have some experience with art but it's not my strong point, the biggest problem will be the characters because i'm going to need lots of them. I'm probably going to use a base 3D model for that and alter it for each or most characters. The main reason i'm making this game is learning experience, i do not plan to sell it but if it's going to be the game i have in mind i might ask a view bucks for it eventually. I started on the actual game. 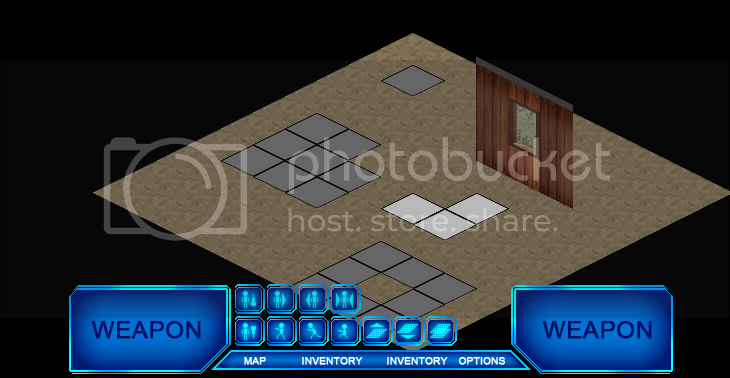 I have made a "temporary" gui, it's temporary because it's way too futuristic but it will function for now. What i eventually want is the look of fallout's pip boy but that would have taken way too much time and i'm too eager on actually start coding my game. I'm also still debating about all the buttons, in the picture not all buttons show, i need at least 26 buttons and a couple of gauges for life, movement points, etc. But i think i will move some buttons out of the gui/hud eventually and make a drop down when the character is being clicked for character specific buttons like walk, run, crouch. So this is the game program that loaded the map i created in the editor. I will be testing path finding here, (dirt = 4mp, white is 20mp, grey is unwalkable) the character should always walk the lowest movement cost route. So i better start programming . Made a quick character too, don't laugh , will eventually replace is with shooting still frames from a 3D model. this thread should give you an idea of what im talking about.